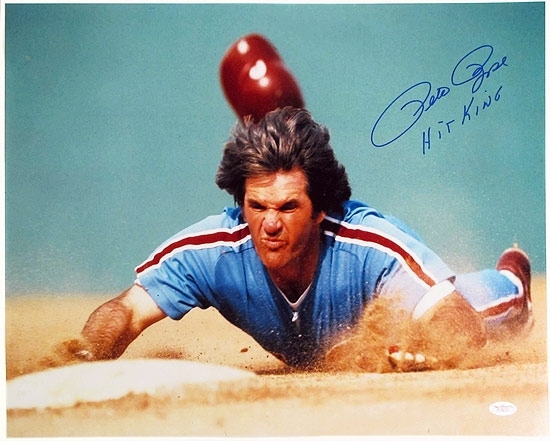 Pete Rose was one of the most dynamic and entertaining baseball players of the 1970s and early 1980s. A proven winner, "Charlie Hustle" never cheated the game or his fans as a player. As a result, Pete Rose cards and autographed memorabilia both have a storied history. While allegations of illegal betting as a manger led to a lifetime ban from baseball in 1989, many fans and collectors disagree over the validity of such a punishment. 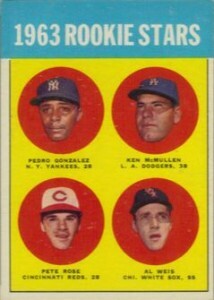 Pete Rose's rookie card, which is part of the 1963 Topps Baseball set, is highly desired by vintage collectors. High-grade samples sell in the $2,500 - $3,000 range. Even lesser grade cards command several hundred dollars, which is a testament to Rose's overall collectibility. As the hobby reinvented itself in the mid and late 1990s with the advent of autograph and memorabilia cards, Rose was a displaced player. Left off of checklists for years, it wouldn't be until 2007 Sportkings that Pete Rose had a mainstream autograph or memorabilia card. However, his first autographed card has a fairly interesting story behind it. In 1985, Topps produced a 120-card set dedicated to Rose. The sets were distributed through Renata Galasso Inc. At some point, a majority of the sets were obtained by Ken Goldin of Scoreboard Inc. who then had Rose sign the first card in the set. The autographs were created on the secondary market, but they're readily available and widely accepted. In more recent years, Upper Deck, Panini and Leaf are among the companies to have released Pete Rose autograph cards. 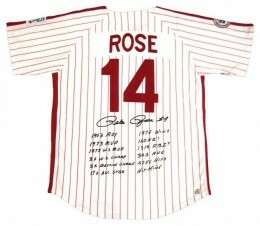 While some are recognized by the MLBPA, no MLB set has yet to have a Rose autograph. Pete Rose's signature can be found on just about anything. He has not been shy with peddling his signature and as a result, supply has long exceeded demand. 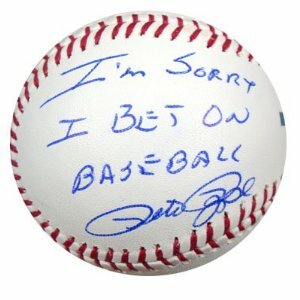 You can pick-up a Pete Rose autographed card for under $10 and balls for under $30. 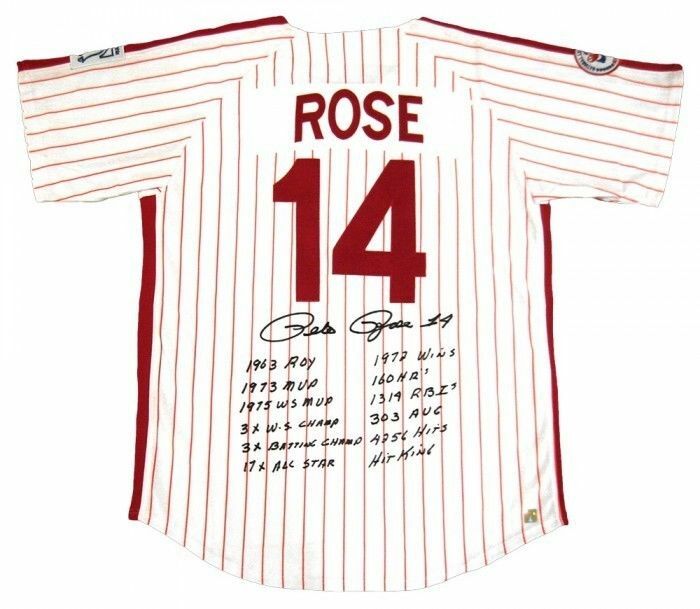 Rose signed items that have the best possible potential to ever increase in value are items related to his days with Cincinnati's "Big Red Machine" of the 1970s. Some of his inscribed pieces, especially pertaining to his betting and subsequent ban, are also popular. As was customary for the era, Rose is just one of four players included on his official rookie card. This particular design is often referred to by collectors as "the floating heads" card. A truly iconic card, but more for it's ugly design than any aesthetically redeeming qualities. Below you will find an example of what Pete Rose's authentic signature looks like. This can be used as a first point of reference for determining the legitimacy of autograph memorabilia, but is not a substitute for having your items authenticated by a well-respected professional autograph authentication company. Some of the trusted sources within the sports memorabilia market include the following companies: PSA, JSA, Steiner, Mounted Memories and Tristar. Click on any of the images below to view full size photos. The signature displays a pride of penmanship, even into his older years. The signature leans to the right. The "P" and "R" are over-sized and dominate the signature. The letter "P" makes a kidney bean type shape with the starting and ending lines crossing in the middle of the shape. Both of the letter "e"'s are distinguishable with the first being slightly larger and forming a more open loop than the second. The pen strokes of the letter "R" are difficult to decipher; What can best be described as a partial "@" flows into a oval shaped loop that drops below the signature. The "o" is legible and open as are the "s" and "e."
PETE ROSE Baseball Signed Autographed Personal Check JSA PSA Guaranteed 1983! !